I remember when people sniffed at the idea of Amazon being more than books. When Jeff Bezos reinvested all his profit into opening up other shops, people said, "Diluting the brand?" and other naive things--I might have been one of them. This week, I looked at my credit card statement and realized they were getting a bunch of my money. More than the usual regular book purchases for work and play. And I wasn't unhappy about it. I had a warm glow when I reviewed my charges for movies and other digital downloads. 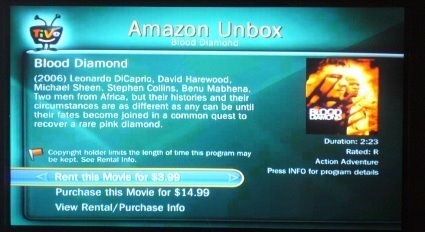 Amazon has become my main digital content provider. Other people are buying from iTunes more, but I'm a movie/TV/book girl, and Amazon has me covered right now! I got two pieces of gadgetry this year that reinvigorated my love affair. The first is the Tivo Series 3 (HD), gotten in expanded and discounted form from WeaKnees.com. (Another highly recommended company with good service, by the way!) As you may know, I was a TiVo UI designer way back whenever (version 2) and still own stock and love for most things TiVo. The Series 3 works nicely with my Verizon FIOS which feeds me good bandwidth and HD TV. Back to Amazon. The other day my cat unplugged one of my TiVos and I missed an episode of Chuck. Remember the days of looking for friends who recorded stuff? I could've found it online in various ways for free, but it was convenient to just browse for it on Amazon Unbox via the TiVo, from my couch, and order that missing episode just like that. Worth the $2 for savings for my time and hassle. Early in the year, I cancelled my Netflix subscription which I was never using, because of Amazon Unbox. I don't want to watch video on my PC, either. Now that Netflix and TiVo finally get their act together on streaming, I'll probably check that out over the holidays and see what it's like in terms of content amount and quality of streaming experience. A list of Best Books of 2008 from Amazon editors' top picks -- I'm not so convinced by some of the capsule reviews, but hey, I'll send free initial chapters to my Kindle to check out! In a couple clicks, I've got 8 books to try out. I read and like the first few chapters of one, so when I get to the last Kindle page, I click on "Order this book now." It checks that I'm not making a mistaken click, I confirm, and it downloads in seconds. Hooray! No regrets. Make to Stick keeps getting good press among recent business books. I'm not willing to take up room on my increasingly groaning shelves if I can get this by Kindle - and yep, I can! Sample checks out as actually interesting, I can now read it as one of my background non-fic reads. A friend recommended the Dresden Files books; earlier this fall I got hooked on the bad but addictive Twilight series. These literary wonders-- and more importantly, their sequels-- can be had by Kindle without driving to a store or waiting for mail to come. One click from a late night bed and I can keep reading. I owned The Diamond Age in paper form but did get around to reading it. It's long and the font is small. You know what -- I read it by Kindle instead, since the font can be jacked up to a more reasonable size and carrying it doesn't require muscles. I also own the wonderful Jonathan Strange and Mr Norrell in hardcover, all 1000 pages of it. I will not have to carry THAT around again, I'll be able to read it on the Kindle next time. Er, no, it seems I can't yet - so I'm clicking that link on the left side of the page requesting it be made available by Kindle format. Same for Foucault's Pendulum! I can't keep up with long blogs, or most blogs anymore. But I sure can read Cognitive Daily and MIT Tech Review and a few others by Kindle, when I have a spare minute for the short stuff. Cory Doctorow and a number of other writers are making free ebooks available for their stuff. Cory's "Little Brother" got raves this year. I loaded it on my Kindle by USB cable. Fanfiction - in a moment of weakness on a business trip, I started reading fanfic again, after a few years off. I can send PDF's and Word docs to my personal Kindle address, without having to even plug it into my computer. Yeah, I suppose you could use that feature for something worklike, too. It's unfortunately convenient. There is a LiveJournal community all about this fanfic-on-Kindle habit. I like switching between genres and books and being able to bookmark pages, save clippings for later blogging, etc. I used the "lookup word" function a ridiculous number of times while reading The Diamond Age. It was all that Victorian English. I don't love the web browser "experimental" functionality - it's slow by phone WhisperNet, but it will do in a pinch! I can read my twitter feed on it. I once settled a discussion of what the male version of "ballerina" is using my Kindle from a wireless-free zone of Northern Maine on a bird watching trip. Tom Disch, a poet I liked reading on LiveJournal, killed himself this year. In a sad weekend, I copied and saved all his journal poems into a Word document and loaded it onto my Kindle. Now I can kind of keep him around. Free ebooks... Manybooks is one site, and if you load this Feedbooks guide, when you click on any of the contained book title links, it will automatically download the whole thing to your Kindle. I got myself a bunch of old Rafael Sabatini adventure novels for one trip this way. I could go on. The Kindle has something to do with me starting to read a lot again, like I used to as a kid. There are some minor negatives, like slow page turning (I would NOT use it for holding reference books), but nothing that overwhelms the good. I still order paper books, and always will; but I have a house busting at the seams with bookcases, and carrying them around isn't always convenient. 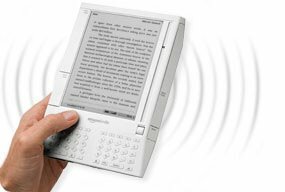 The combination of a very long battery life, and small form factor, WhisperNet with excellent Amazon shop experience and sample chapters, make the Kindle way more than the piece of white plastic a lot of people dismiss rather easily. I wouldn't get a Kindle if you expect great web connectivity, a multi-app computer experience, or a backlight... but get it if you read a lot of popular books, and especially if you travel a lot. In sum, Amazon can take my money, for books and movies. Thanks, Amazon! I've been using amazon as my music provider recently, and they've got it absolutely right. For a couple of dollars off the album price, you get 256kbps MP3s with no DRM, hooray. The main problem is that it's so addictive and easy. I came back from Cadillac Records thinking "it's dumb I don't have any Muddy Waters," and ta-dah there it is on my hard drive a few minutes later. Updated to add (12/29): Netflix streaming over TiVO Series 3 HD is really very nice. I renewed my sub to Netflix, although I expect to keep using Amazon for a different selection, and because their downloads also work on my non-HD TiVo and tv.